This weekend I am looking forward to joining Jessica (DDiL to be) on her Hen Night. I am honoured to have been invited (I shall be the most ancient person there and also the only sober one as I am unable to tolerate alcohol) and have had fun planning what I shall wear etc. I shall be going with Saz who is one of Jessica's bridesmaids and we have booked overnight accommodation so we can relax. Most brides like to indulge in a hen night as an opportunity to celebrate their upcoming wedding day with close female friends and family. Dancing the night away or spending the weekend at a luxurious spa are among the popular choices, some brides may even organise a holiday. Today, these celebrations are viewed as a fun way to say goodbye to unmarried life, but this wasn't always the case. 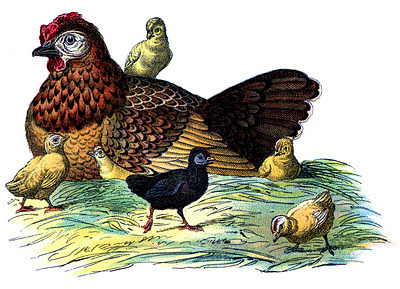 In Middle English the word hen meant any female bird, which established the hen night as a woman-only affair. The tradition grew during the reign of Charles II (1630-1685) where it became an opportunity for the bride to contemplate her 'bottom drawer', a dowry of precious things collected in preparation for marriage. In contrast to the parties of today, this bride-to-be would spend the evening quietly at home with her family. The tradition of the stag night is said to date back to the Spartan soldiers of Ancient Greece. The men would gather the night before the wedding to feast and gamble, as a way for the groom to say goodbye to his bachelor lifestyle. It was also said to be his last chance to gamble and to hide away his winnings, because after his marriage his wife would control his purse strings. Despite such joking sentiments, marriage was actually very highly regarded in Sparta. In Ancient Britain, stag parties were held to ward off the presence of evil spirits before the big day. In Victorian times, being a wife was seen as a natural role for a woman and the concept that she might entertain doubts before her wedding day simply wasn't considered. A traditional hen night, if it was held at all, was a small, private gathering where women talked and the bride contemplated her future duties as a wife. Jessica's Hen Night will be a surprise for her, organised by the bridesmaids but with strict instructions from Jess that it is to " definitely be a very civilised affair, no strippers and no chocolate willies" - not like some of the drunken hen trips to Majorca that get featured on the television every so often, thank goodness!! Photos to follow, have a good weekend whatever you're getting up to. Have a good fun week-end. In my neck of the woods, a hen party could just be a get-together with the girls. Have a great time! My generation skipped the hen party; my mum had one and her granddaughter was celebrated as well. Interesting post, have fun. I didn't reliase that the wedding was so close! Glad that it's to be a civilised affair - hope that you have fun!